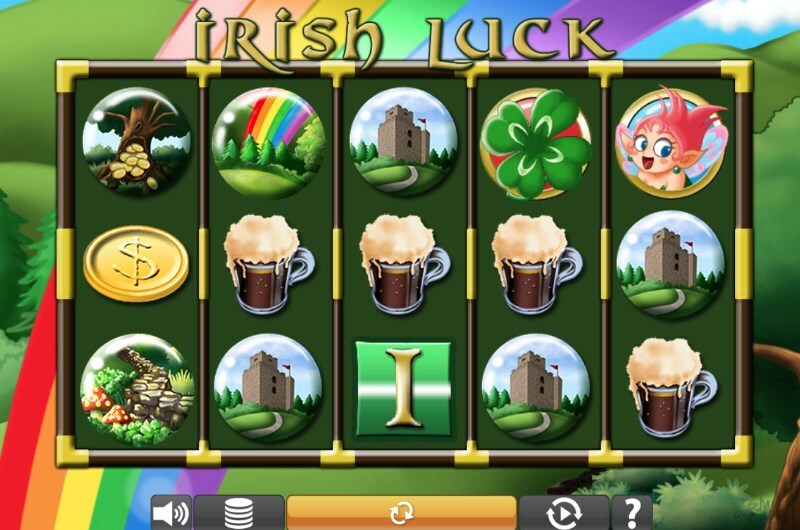 Have the craic with Irish Luck slots: the 25 line and 5x3 slot from Eyecon. Like the name suggests, this game takes us to a world inspired by Irish folklore. And these lucky elements mesh with the creative bonus features. 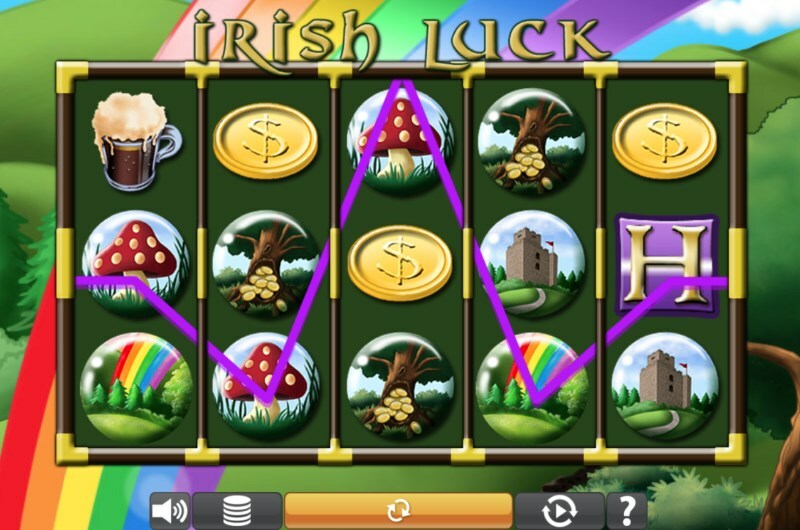 We all know Leprechaun's hide pots of gold; but did you know they also hide free spins and massive 100x multipliers? Keep an eye on those Fairy scatters as well - these magical beings can deliver some big win opportunities. Keep reading for our full Irish Luck slots review. Irish Luck features all the hallmarks and cliches of Irish folklore. But these are delivered in a tasteful - and colourful way. Rainbows, leprechauns and pots of gold can all be found on the reels. The slot also nods to elements of Irish culture - one of the game symbols for example is a foaming glass of dark ale. The slot does not contain any random bonus features. Instead, the two primary bonus rounds are activated by a combination of scatter symbols. One symbol to watch out for is the four leaf clover - which acts as the games wild symbol. The four leaf clover symbol only appears on reels 2 and 4. If this symbol does appear on the reels and substitutes for a win, then the winnings will be doubled. You will be partying like the Irish if you activate the Irish Luck slots free spins. To trigger the bonus, you will need to land three of the Leprechaun scatter symbols. This will take you into a prize pick bonus round. The scatter symbols that fell on the reel can now be picked - revealing prizes underneath. How many picks you receive depends on how many Leprechauns triggered the feature. Land the maximum 5 scatters and you will be able to make five prize picks. Each symbol can reveal massive multiplier rewards (up to 100x) or you could reveal 10 free spins. Land three Fairy scatter symbols and you will be able to play another picking game. This time, you will need to pick clovers until you find a matching pair of prizes. Once a pair has been matched, the bonus will end and the prize will be awarded. The Match & Win bonus cannot be triggered during free spins. The Irish Luck Slots RTP is set at 95% - which is considered average for an online slot game. In terms of variance, this Eyecon slots game is considered to be medium. This gives the game a wide range of appeal. Wins are consistent, mostly in the low-value territory. But there are chances for even bigger wins. Speaking of wins - there is a jackpot prize available. And this is paid out upon matching the letters that form the word Irish. Spelling the full word pays the biggest prize in the game at 3,000x. Other notable high paying symbols include the tree stump with gold coins pouring out. A five of a kind win with this symbol will award 1,000x your total staked bet. If you want an Irish themed slot to rival Rainbow Riches, then this game is perfect. Play Irish Luck slots if you enjoy plenty of bonus variety, the chance for jackpot prizes and a forgiving variance. Try this game right now at Pots of Gold Casino.